Studies of primates suggest that the amygdala plays an important role in the development of anxiety disorders. Researcher Ned Kalin suggested at the 2015 meeting of the Society of Biological Psychiatry that the pathology of anxiety begins early in life. When a child with anxiety faces uncertainty, the brain increases activity in the amygdala, the insula, and the prefrontal cortex. Children with an anxious temperament, who are sensitive to new social experiences, are at almost sevenfold risk of developing a social anxiety disorder, and later experiencing depression or substance abuse. A study by Patrick H. Roseboom and colleagues presented at the meeting was based on the finding that corticotropin-releasing hormone (CRH) plays a role in stress and is found in the central nucleus of the amygdala (as well as in the hypothalamus). 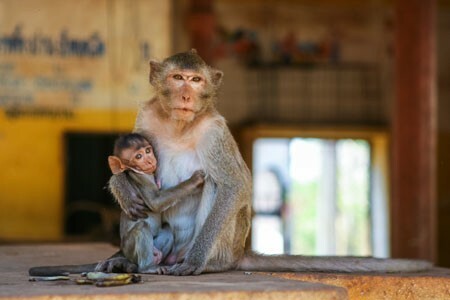 The researchers used viral vectors to increase CRH in the central nucleus of the amygdala in young rhesus monkeys, hoping to determine what impact increased CRH has on a young brain. Rhesus monkeys and humans share similar genetic and neural structures that allow for complex social and emotional functioning. Roseboom and colleagues compared the temperaments of five monkeys who received injections increasing the CRH in their amygdala region to five monkeys who received control injections. As expected, the monkeys with increased CRH showed increases in anxious temperament. Brain scans also revealed increases in metabolism not only in the central nucleus of the amygdala, but also in other parts of the brain that have been linked to anxiety, including the orbitofrontal cortex, the hippocampus, and the brainstem, in the affected monkeys. The degree of increase in amygdala metabolism was directly proportional to the increase in anxious temperament in the monkeys, further linking CRH’s effects in the amygdala to anxiety.